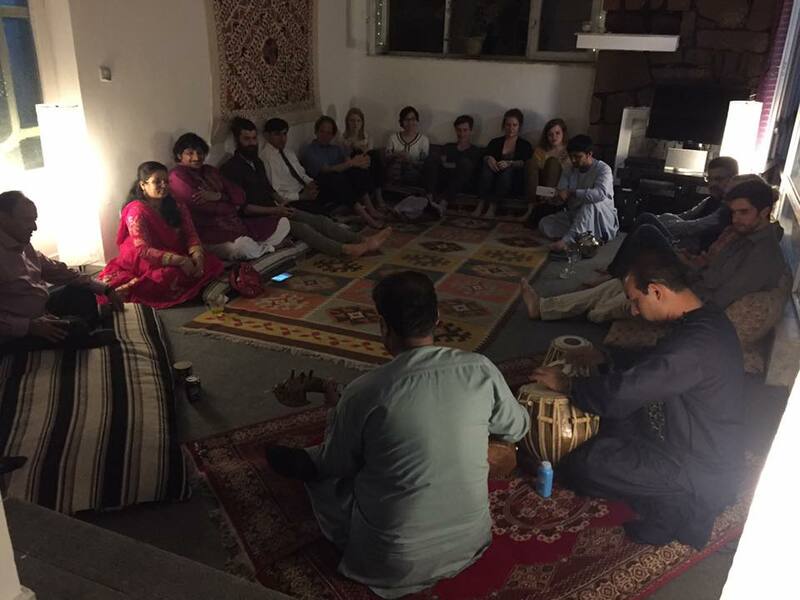 On Saturday, May 21, 2016, I was part of a remarkable party hosted by Allegra Boggess, Shabeer Kabuli, and Emma Ayres at their house in Kabul, which ended up being one of the most unusual and inspiring evenings of music I’ve ever heard. The performers among the guests included a wonderfully varied group of musicians, from a classical pianist (me) to “The String Contingent,” an Australian-based acoustic folk group consisting of guitar (Graham McLeod, a Scotsman), violin (Chris Stone) and cello (Monique Bartkowiak), who played a wonderful collection of improvised and composed material, written by group members, and influenced by a wide range of styles. 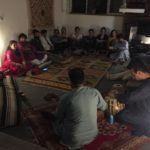 Then Afghan music performed on rubab and tabla (Ramin Saqizada and Fraidoon Miazada—here’s an example of them on YouTube). And, for a grand finale, two sitars played by Indian husband and wife virtuosi Abhishek and Murchana Adhikary with Fraidoon again on tabla (their website and an example of their playing). 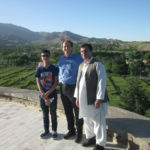 Others there to listen were a broad representation of ANIM’s faculty, including Dr. Ahmad Sarmast, the founder and genius behind the Institute, clarinetist and composer Ustad Ahmad Shefta, and Ustad Murad Zarabi, who runs the academic side of the school. The evening began with social time with dinner (centerpiece was an amazing special tandoori kebab that Shabeer had told me about the day before: whole lamb stuffed with spices and roasted in the tandoor), followed by a concert that could not have happened anywhere else, I think. The audience, that is, all of us who were there, sat around the living room on traditional Afghan cushions against the wall. 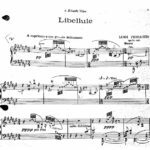 At Allegra’s request, I began, on her Yamaha digital piano, playing the Schubert B-flat Impromptu and the last two sections of Mario Castelnuovo-Tedesco’s Piedigrotta 1924, a Neapolitan Rhapsody. Certainly an interesting experience on the digital piano—pedal effects not quite what I’m used to, for sure, without the acoustical space that the inside of a grand piano gives. Next came The String Contingent, doing three original tunes—Western instruments in the service of an eclectic and wonderful folkish music that had nothing to do with what I’d just played. Some fantastic fiddling, and great riffs from cello and guitar, a great mix of composed and improvised performance. This was only Monique’s second public outing with the group (the first had been the night before). She’s a temporary sub for Chris’s partner Holly, a bassist. She sounded like she’d been with them forever. Then Ramin and Fraidoon showed off a number of fantastic Afghan tunes. Both are amazing on their instruments, and their collaboration was full of joy, energy, daring, and beauty. As someone who plays plenty of Western chamber music, watching this kind of collaboration is inspiring: how much these guys were in the moment, the playfulness of some of what they did together (is it over? It’s not! ), the facial expressions when something worked particularly well. This was so engaging—I could have easily listened all night. To finish, Abhishek and Murchana performed on their sitars joined by Fraidoon on tabla, giving us first a Hindustani piece, then a classical Indian one, showing another aspect of collaborative art: knowing a style so well that they can change on a dime, do a different thing than they’d originally planned because it fit the evening better, and play a continuous and engaging game of “can you top this” —“dueling sitars” as I told them later. What a fantastic musical journey. Everyone there enjoyed all the offerings, varied as they were. The atmosphere, with a small international group in an intimate space, was inspiring for musicians and listeners (many of us in both roles). The coming together of such diverse musics—and the ability for all of us there to appreciate what we heard in spite of our individual unfamiliarity with some of the different musical languages—made for a musical evening I won’t soon forget.